Traditionally womens sport has been considered the less popular cousin to mens sport. This has been evident in sporting attendances, tv deals and media coverage going back decades. With the AFL launching its womens competition, and the threat from its financial and support strengths, it seems the latest sporting battlefront is emerging. So who are the players? After previously paying to have its content broadcast on the Ten network, Netball Australia signed a 5 year commercial deal with the Nine network and Telstra in March 2016. The deal, which begins in 2017, a Saturday night live double-header on Nine, as well as two delayed games. Telstra will broadcast two exclusive matches per week live via Telstra TV as well as simulcast Nine’s two live matches, and all games will be available live on a “Netball Live” mobile app. Netball Australia has also dropped the New Zealand teams from the competition, and added three new teams – Greater Western Sydney, Collingwood and the Melbourne Storm will all form netball sides in the competition for 2017. The Storms team, will actually be operated out of the Sunshine Coast in Queensland, and be called the Lightning. Then theres the wage deal, announced in September 2016. The new national league next year will see 80 players share a pool of almost $5.5 million and it is hoped the sport could become fully professional within five years. Under the new collective bargaining agreement, the average salary for netballers will rise from about $40,000 to $67,500, and the minimum wage more than doubles to $27,375. The deal includes breakthrough conditions, like clubs paying for children under 12 months old and a carer to travel to games with players, private health insurance and income protection for up to two years in the event of injury or pregnancy. For the first time, all athletes will be on 12-month contracts. The hours between 10:00am and 4:00pm will be off-limits to training, to allow women to work and study. Cricket is arguably running ahead of the curve, and may have even sparked the latest developments with its WBBL season launching in 2015 to wide acclaim with the first two games attracting three times the audience of free-to-air A-League football matches that season. Cricket Australia are sharing the costs of the WBBL production. In April 2016, Cricket Australia said that Australia’s leading female cricketers will be the best paid of any women’s team sport in the country after they announced significant pay rises and doubled its commitment to Australia’s elite female cricketers from $2.36 million to $4.23 million. This will see maximum retainers for the Southern Stars rise from $49,000 to $65,000. When combined with increased maximum retainers for the Women’s Big Bash League of $15,000 the base rate for Australia’s best female players rises to $80,000. In October, the Commonwealth Bank announced support totally 5 million a year over 3 years for womens programs, including the WBBL. Womens Soccer seems to be a little behind the 8-ball here as the W-league has been subject to some pretty severe criticisms in 2016 over its pay and conditions. A PFA report released in September showed a quarter of W-League players were paid less than $500 for the 16-week season, and 10 per cent weren’t paid at all. With an average cost of $2237 worn by each W-League player to play in the league, it’s likely more players than not were out of pocket for their participation. Only 15 per cent earned more than $5000 for the past season, which equates to $312 a week without factoring in pre-season training. The salary cap for the national women’s league is set at $150,000 per club, with a minimum spend of just $35,000. Teams that paid the minimum spend would have paid a 20-woman squad an average amount of just over $100 a week per player – with no recompense for pre-season. Perth Glory, the 2014 W-League premiers, won the league paying their squad just $50,000 – or under $160 a week per player. In September 2016, the FFA set up a working party with the PFA to look at womens pay and conditions. On October 18, it was reported that W-league players at the Brisbane Roar may have to take a 40% pay cut. However, Brisbane Roar later issued a statement saying the salary cap investment by the Roar for 2016/17 season will increase from $50,000 to $150,000, with greater investment in the team’s coaching staff, medical department and support staff. Fresh from the Olympic Games where the womens national side took out the Sevens Gold medal, the ARU hopes to attract more women to the game using this format. A day after the AFL announcement, NRL chief executive Todd Greenberg said he wanted his code to establish a domestic women’s league by 2021. In 2015 and 2016, the AFL reported record ratings for its womens exhibition games between Melbourne and the Western Bulldogs. In June 2016, the AFL announced its 8 team competition to launch in February 2017. The teams include Adelaide, Brisbane, Carlton, Collingwood, Fremantle, Greater Western Sydney, Melbourne and the Western Bulldogs, although 13 of the 18 AFL clubs did apply for entry – and some of those will be granted entry in 2018. A number of players have been recruited from other codes for this competition, including a number of soccer players and basketball players, as well as several athletes. 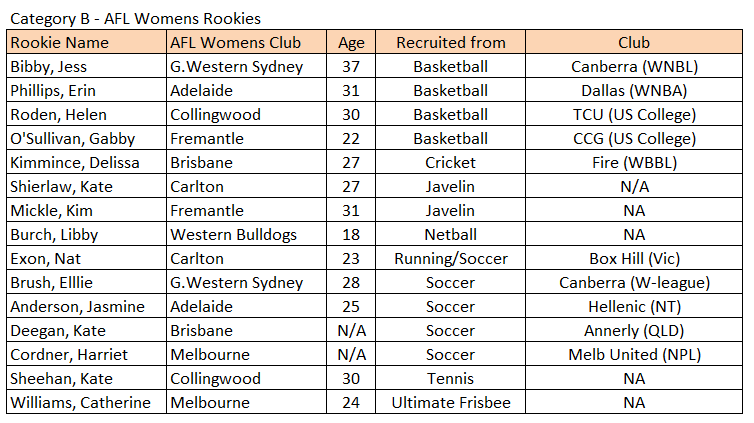 As part of the rookie listings, AFL clubs could list players that hadnt played the game before. Even more players were taken during the National draft, some of these will be trying to do double duty in both their codes. 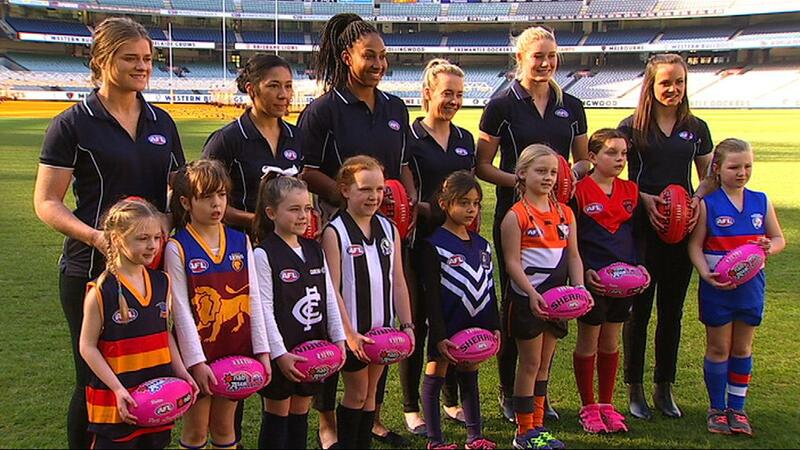 In September the AFL announced this competition would be known as AFL Womens. The competition will have NAB as its naming rights sponsor, estimated to be worth 2-3 million a year. Players will be part time in 2017, with a view to being full time professional in the near future. MARQUEES will be paid a confirmed $10,000 marketing component and proposed $15,000 playing fee. PRIORITY pre-signings — one at each Victorian club and Freo, two at Adelaide, Brisbane and GWS — will command a proposed $10,000. HIGH draft selections — possibly four at each club — are also on the $10,000 mark. REMAINING players would receive the minimum $5000. The Heraldsun later reported that this had been rejected by the AFLPA. Private health insurance isn’t included in the proposal, meaning players could have to shell out thousands for cover, eating into their wage. That cost could be defrayed by deals brokered by the AFL with insurance companies. Players will sign an employment contract based on an hourly rate of pay, which means there will be restrictions on how much time players can spend at their club each week. Players could be limited to nine contact hours a week outside match day, which could equate to three training sessions. The players will be required to do 20 hours of appearances and marketing duties for the AFL as part of the basic contract. No broadcast deal has yet been finalised.